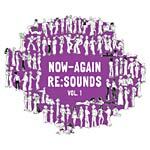 Various Artists - Now-Again Re:Sounds 7x7"
Now-Again Records does it up proper-like, delving into the magnificent world of soul and funk, twisting and turning knobs until it's been turned upside down! Remixes, and revamps from fan favorites such as Edan, Guilty Simpson, Quasimoto, Koushik and Aloe Blacc, paired alongside the originals from Amnesty, Heliocentrics, Timothy McNealy and Roe-O-Tation. Set of seven 7'' inch singles released as a nifty box set. Some tracks on these singles are not available on the CD, so cover all bases with this purchase. Believe us, this is one of the best releases out! Essential listening! Please note: due to the weight of this box set there may be an additional shipping charge, depending on the shipping address for your order. We will contact you for approval of any extra charges before shipping.